The Fellowship of Reconciliation was established informally in 1914 by Henry Hodgkin, an English Quaker and Friedrich Sigmund-Schultze, a German Lutheran, who were returning from a failed ecumenical conference in Switzerland hoping to prevent the outbreak of World War 1. Hodgkin and Sigmund-Schultze pledged to find a way of working for peace even though their countries were now at war. The FOR was founded formally in Cambridge England in December 1914, and the American organization in 1915. The FOR has since become an interfaith and international movement with branches in over 40 countries on every continent. Since its founding the FOR has worked internationally for peace and social justice. It helped organize the National Civil Liberties Bureau (which became the ACLU) as well as the first National Conference of Christians and Jews, as well as international pro-union and anti-war organizing. In the 1940s it worked against interment of Americans of Japanese descent, and in Europe FOR members rescued Jews and political refugees from the Nazis. In America, in 1947, they sponsored the first inter racial ‘freedom ride’ to challenge discrimination in interstate travel. In the 1950s the FOR helped organize the American Committee on Africa to support African independence and conducted a six year program to help feed China during a time of famine. Also in the 1950s the Fellowship worked with Martin Luther King Jr during the Montgomery bus boycott and held workshops on non-violence throughout the South. This comic book was produced as part of that work. The book was the idea of Alfred Hassler, who was, in 1956, the Publications Director for the FOR. He could see the need for a solid educational tool for non-violence in what was going to be a time of social change. He worked over a two year period to develop the book with Benton Resnick. Resnick is referred to as the writer elsewhere, but that seems erroneous. Resnick was business manager for Toby Press, which had ceased publication in mid 1955 and was operating as Graphic Information Service at the same address, and was apparently known as the Al Capp Studio. Elliot Caplin was Al Capp’s brother. He had been a writer for King Features beginning in 1937 and became an editor for Parent’s Magazine’s True Comics in 1942, where he continued, interrupted by military service, until 1949. The Capp Studio and Toby Press were set up in 1949 to handle the reprinting of Capp’s Li’l Abner comic strip, and soon branched out to issue other strip reprints and new material. Caplin is listed as editor, and has one listed writing credit in 1952’s Tales of Horror #1, but he was also writing the comic strips Abbie and Slatts and Big Ben Bolt, both of which he co-created and he co-created Juliette Jones during this time. 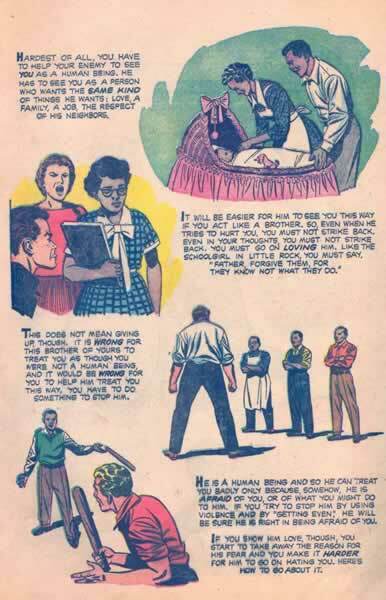 Around 1949 he drew and presumably wrote the liberal anti-Taft comic, which was notorious for it’s strident politics. Benton Resnick has no known writing credit, though Benton Rice is credited with at least 8 text stories in Toby Press books. His son believes he handled only the business and production aspects of the Montgomery project. My own assumption would be that he was somewhat of a de-facto editor, but I don’t think Alfred Hassler needed an editor. It was his project and he knew what he wanted, and Resnick was the guy inside the Capp Studio, dealing with the client. Benton Reznick is referred to elsewhere as being blacklisted, but this is not easily substantiated. He was allegedly blacklisted after testifying before the senate, and sometimes the Committee to Evaluate Comic Books is connected but this makes little sense. The Committee to Evaluate Comic Books was a religious/civic improvement organization in Cincinnati, Ohio, 1948 – 1979. They seem to have written letters, collected information, and held meetings to report to each other on their correspondence and comic book reading. They created a scale for rating the contents of comic books, published their findings in parent’s magazine and contributed Exhibits 6a, 6b and 7 to the 1954 Senate Sub Committee to Investigate Juvenile Delinquency. 4c. New York State Legislative Document (1954) No. 37, Report of the New York State Joint Legislative Committee To Study the Publication of Comics *285. But they were a self appointed citizen’s committee in Cincinnati. They had no blacklist against individuals and they had no conceivable way of interfering with someone’s life and livelihood other than indirectly, through cultivation of an economic boycott against the comic book industry. Here’s the Back Cover of an Original Edition With a Contemporary Newspaper Article Attached. Al Capp has been described elsewhere as respecting King and his work, and a closet liberal despite the right-wing rhetoric of his work. Recently the cartoonist James Romberger has identified the artist as Golden Age great Sy Barry. The early script was read and commented on by Dr. King and some of his ideas were used in the printed version. The comic is a standard format commercial job: 16 pages, paper covers and about 7 x 10 inches. The Spanish version is slightly smaller, as was common in South American comics and redrawn from the American originals. The book opens with a quick review of Dr. King’s early life as the son of a prominent Atlanta Pastor, where the Bible was the cornerstone of the family. King is shown as he grows and continues to let the Bible guide him as he finishes his education, marries and returns to the South in 1954. The narration of the story then shifts to the first person account of a black Southern ‘Everyman’ who explains life under Jim Crow in quick and sanitized comic book language before telling the story of Rosa Parks, whose refusal to surrender her bus seat to a white led to the Montgomery bus boycott. The boycott was successful in keeping blacks off the buses, thus demonstrating their economic importance to the community as a whole, and the Montgomery Improvement Association was created to work for fair treatment towards blacks. Reverend King was chosen as the organization’s leader. The movement for equality is shown to be based in the church, and non-violence and organization are shown to be the reasons for the success of the boycott in the face of violence, intimidation and the bombing of King’s house. As it becomes obvious that the boycott will end, the Improvement Association continues to organize non-violence workshops to effectively deal with the resentment and intimidation that will surely follow. Non-violence is shown to be a workable tool in the real world in the face of increasing violence, KKK marches, cross burnings and church bombings. 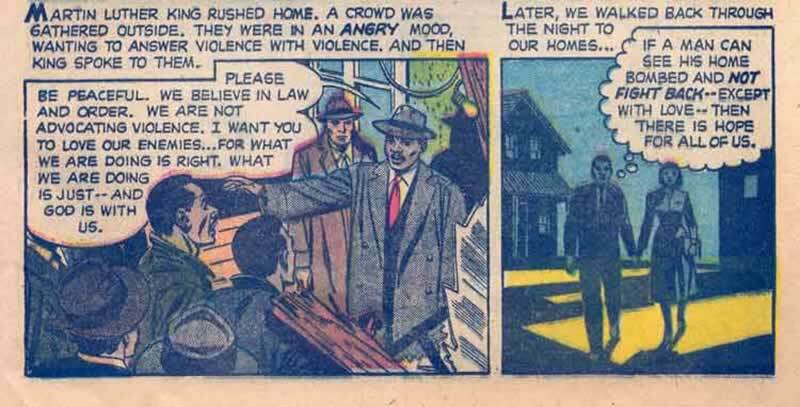 Segregationist violence outrages the majority of white citizens, and the story closes with the black narrator confiding to the reader that he’s even thrown away his gun. 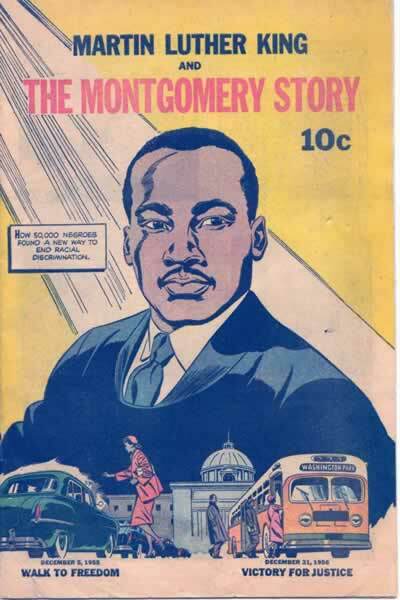 The second story is titled Martin Luther King Tells How A Nation Won Its Freedom By The Montgomery Method. This is a two page telling of Gandhi’s struggle against the British in India, told as a sermon or speech by Reverend King. Next is a three page piece titled How The Montgomery Method Works. The foundation is that God loves us as individuals, and as individuals we must act on this love. We are told to remember that God loves our enemies as much as he loves us, and that we must never deny the humanity of any person. The commonality of all humans is stressed as are study, patience and reasoned discourse in the face of intimidation. This is a beautiful book. It is well written and the art is at the top of professional standards. There were 250,000 copies printed and another 125,000 in Spanish. They were used as teaching tools during the civil rights movement, and not many have survived. Freedom Marchers were told to memorize the book and destroy it. The importance of the book has been attested to by John Lewis, who’s graphic novel March is the story of his own involvement with Dr. King and the civil rights movement. When Arab Spring Broke out in 2010, protest organizers looked to history and the internet, wanting to know more about Gandhi, King and non-violence, and this is where they found this comic. The comic was eventually translated into four local dialects, and has widely been credited as being as effective teaching tool in 2010 as it had been in 1958. 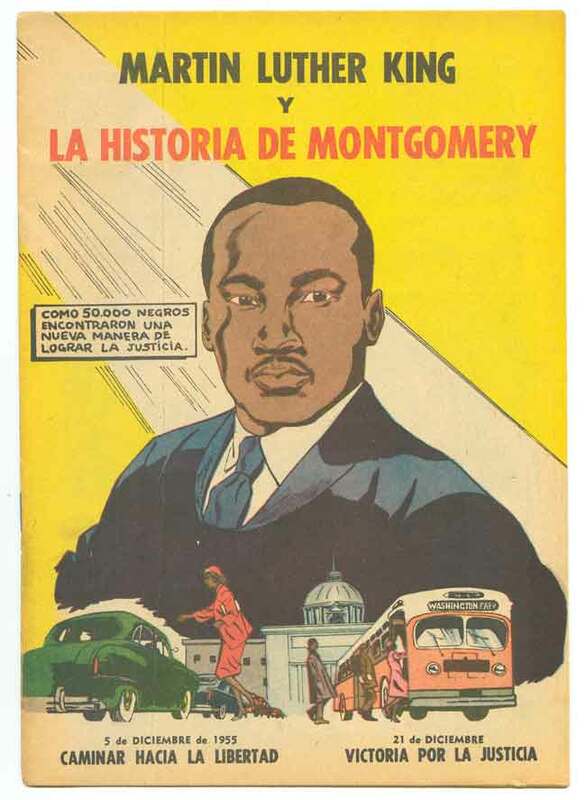 The new use of the comic was covered as news in the United States and this, along with the continued interest in the comic among collectors, prompted the Fellowship to reprint both the English and Spanish versions in 2011 and again in 2013. Top Shelf has recently published a reprint for the comic market. The two reprint editions by the Fellowship are not identified as such and this has caused some confusion among collectors. There are several ways of recognizing the different versions. The easiest way to spot the reprints is by the staples. The 1958 original edition has copper coated staples. The 2011 English reprint has aluminum alloy wire bindings, and the Spanish has a glued binding. The 2011 reprints were in the quantity of 15,000 for the English version and 5,000 for the Spanish Version. The 2013 reprints of the English version have glued bindings, and 25,000 were printed. This means the first edition copies will attract a magnet. In 2013 there were also versions printed in Arabic and Farsi, in editions of 3,000 each. 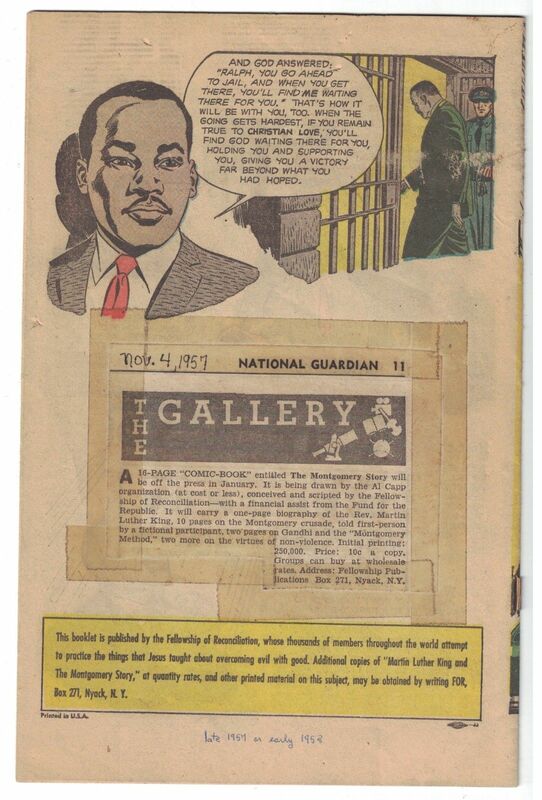 There was a second comic book biography of Dr. King, done by Golden Legacy Comics in the 1970s. Newer comics and graphic novels also exist. The copy of the comic with the newspaper article attached was for sale on ebay. Copies also exist with NAACP and Urban League re-order stamps. Other details were provided in writing or over the phone by staff members of the Fellowship. RE: Arab Spring: correspondence with Ethan Persoff. Ethan was the actual source for the comic, but he told me they saw it first here. He has his copy posted here. At the time, he and I were the only people to have written about the book. 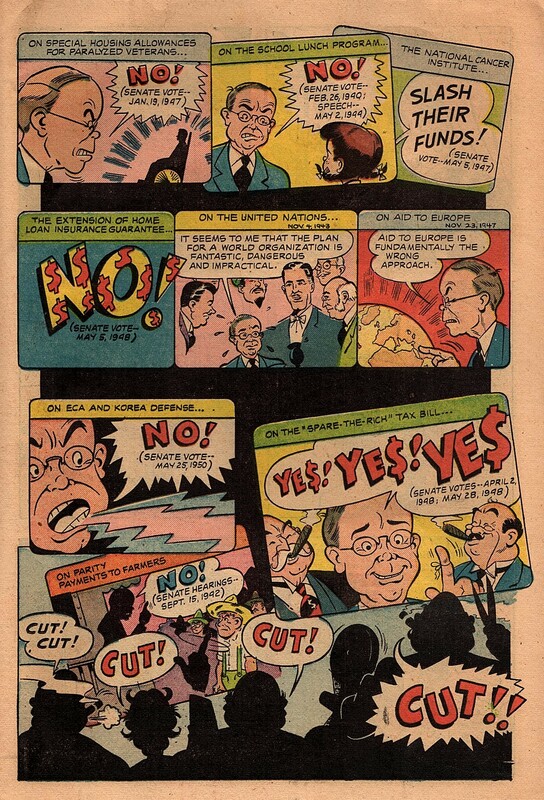 RE: Al Capp’s politics: Golden Age artist Tom Sawyer (Scheuer) worked as Capp’s assistant in the 1960s, he described Capp as a liberal and his conservatism as a business strategy in a 2018 conversation. Thank you to the Grand Comic Book Database and the Digital Comic Book Museum. Here’s a link to an interview with Andrew Aydin, who co-wrote March. The Committee on Evaluation of Comic Books left an interesting archive with the public library in Cincinnati. There are several boxes, containing correspondence, news clippings and classic comics from the length of their existence. I would love to spend a week going through the archive and reading the local newspaper from 1948. Below is the introduction to the archive, which is an amusing story in itself. The Committee on Evaluation of Comic Books donated the comic book collection in the Rare Books & Special Collections Department of the Public Library of Cincinnati and Hamilton County. It contains the founder, Reverend Jesse Murrell’s, correspondence, lists and articles regarding the Committee on Evaluation of Comic Books. This committee was founded in Cincinnati in 1948 shortly after Reverend Murrell preached a scathing sermon regarding comic books in May. Reverend Jesse Murrell of Covington, Kentucky organized the Committee. Another founding member was Ernest Miller, then the associate director, later becoming the director of the Public Library of Cincinnati and Hamilton County. evaluated by the committee. In 1950 the committee’s evaluation list was published in the February and October issues of Parents’ Magazine. It was published in this magazine every year from 1950 to 1959.
sometimes twice. On May 21, 1970, Mr. Miller was appointed the archivist of the Committee and all materials were housed at the Public Library of Cincinnati and Hamilton County, Main Library. The Committee on the Evaluation of Comic Books continued to meet until 1979. “Our major purpose is to help the people formulate critical judgment as to the comics, then we try to help them buy and read selectively.” Reverend Murrell died in 1972; as did Mr. Miller. It was Mrs. Miller, who stepped into her husband’s position on the Committee. She had made arrangements with the Library that the collection remain intact and housed at PLCH Main when the Committee disbanded in April 1979. In addition to being published in Parents’ Magazine the evaluation lists were distributed predominantly by Parent Teachers Associations and church organizations. Some requests for the evaluation list came from police and government agencies, and a few from around the world. The evaluation committee continued even after the industry created the Code of the Comics Magazine Association of America in 1954. Correspondence and pamphlets regarding the Code are included in the collection. A book written by Fredric Wertham entitled Seduction of the Innocent was published in 1954. It was the result of seven years of research and case studies of the effect comic books has on children. His book dealt predominantly with crime comics and implied that it was a worldwide concern. He mentions the forming of local community committees and their efforts to evaluate comic books on page 328. The author believed that legal control of comic books for children was necessary.